Greetings team and how are you all today? I’m doing pretty great I think, I mean it’s a weekend so what’s not to love? 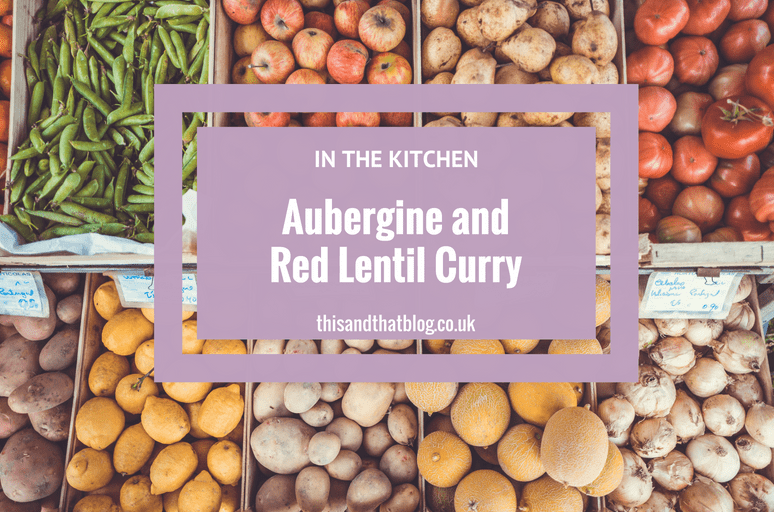 It’s been a while since we shared a recipe with you all, so today I’m to share a recent addition to our cooking repertoire – an aubergine and red lentil curry. It’s once incredibly dish of veggie goodness, that’s delicious, plus simple to make and not to mention super-cheap as well. Basically the trifecta of a brilliant recipe, am I right, or am I right? This delicious aubergine and red lentil curry was introduced to us by the glorious people at Oddbox, when they delivered a recent box that contained an aubergine. I’m not going to lie, I love that the box comes with two or three recipes that vary depending on what’s in the box – it’s super helpful! Anyway we’ve since made this a couple of times and its true love. So hopefully you all love it too. Shall we dive straight in? So there we go, I told you it was the simplest curry recipe around, didn’t I? Also, another bonus (they just keep coming, don’t they?) it’s really good cold as lunch the next day. Just in case that’s your kind of thing! Tell me, do you have any veggie curry recipes that you can suggest to me? I want to keep growing my repertoire of yummy veggie dishes if I can!